With the Formula 1 World Championship having been settled in Japan, it was always going to be hard for the Korean Grand Prix to generate much hype and interest. 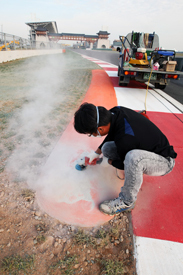 The novelty factor of last year's inaugural event had long gone, and matters were not helped by the implications of a management overhaul with the promoters, which meant development work at the Yeongam track had stalled for almost a year. That delay, which had meant the gates to the F1 area of the track were effectively locked shut for 10 months, meant there was a bit of a shock for teams when they turned up to find things exactly as they'd been left in 2010 – which meant old stickers still on offices and garages, plus food in fridges and rubbish in bins. Some FIA officials also had a bit of a surprise when they went to inspect the podium ahead of the weekend, and found some champagne corks up there. The suspicion was they could well have been from last year's race! Yet despite the difficulties as the new management tries to get a grip on the money issues in holding the event, the F1 fraternity actually came out of the weekend feeling a little upbeat about the place. Yes, there were a few organisational problems, but on the positive side was the fact that, as a back-to-back with Japan, it meant there was plenty of socialising – either in Tokyo or Seoul – which was quite fun. Some of the local 'love hotels', which become accommodation for many over the Korean GP weekend, were not of the quality normally experienced over the rest of the season. But new bars and some good restaurants in downtown Mokpo overcame many of the negative aspects. If the Korean organisers can overcome their troubles, and the Yeongam venue turned into the city-style track that was originally dreamed of, it could have a very bright future. Let's see if we are checking back into our 'love hotels' 12 months from now. 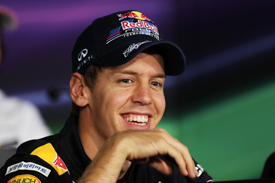 F1 drivers are super-fit athletes who can't afford to let themselves go by celebrating late into the night very often, so world champion Sebastian Vettel confessed to feeling slightly the worse for wear as he arrived in Korea. Having clinched the world title in Japan, Vettel was going to make the most of his achievement – so he did the right thing and celebrated it in style with his team at his Suzuka hotel. Everything had been going pretty much according to plan, until a certain Michael Schumacher turned up and pushed the partying on. Schumacher revealed: "I had a beer together with my boys and, as we heard that Sebastian was just around the corner and I sent him earlier a text to congratulate him, I thought it was most natural to pop in and say hello. We had a few drinks together and enjoyed ourselves. We are good friends so it was a nice night for all of us." "We definitely had a good time and it was quite special, as Michael came and joined us. I think after that I felt much worse as I started mixing a little bit, which wasn't the best strategy!" With the world title over, there was a triple-whammy of birthdays to celebrate in Korea. As well as Peter Sauber and Bruno Senna lighting candles on cakes, there was a huge round of applause in the media centre for FIA photographers' delegate Pat Behar, who had been the subject of a spoof FIA press release suggesting that, at 63, he was in breach of the maximum-age requirements to work in F1! Over the Korean GP weekend, Vettel finally delivered on a deal he made with Rubens Barrichello two years ago. Back in 2009, Vettel had spoken to Barrichello and asked if it would be possible for them to swap helmets. Barrichello agreed and immediately handed over one of his lids, but it took until Korea last weekend for Vettel to finally deliver the Brazilian one of his own. "The boy was doing so well and I said, 'Yeah, of course'. I'd already exchanged helmets with other people, so I gave my helmet to him straight away. Then he went one race, two races, 10 races, 20 races, and I said, 'You might get to Brazil and my friends will make you give me your helmet!' as a joke. "He said it was just that he kept changing colours all the time, but he promised me I'd get it. So it came as a surprise here. Apparently I have the China version from this year, which he has signed." Barrichello's own Vettel helmet is not the first in his collection – he also has a unique Senna example. "I have Fisichella, Trulli, Webber, Schumacher, Button, Kubica, Massa… and I also have a Senna helmet. When I was visiting Arai a long time back, I saw a Senna painted version. It was before he chose to go to Bell from Shoei, and they had these helmets made up for him. So I have the only Arai one painted as Senna. It's just mega!" F1 thrives on the spirit of competition, so it was little wonder that over the Korean GP weekend a spot of gentle evening entertainment eventually turned into all-out war. 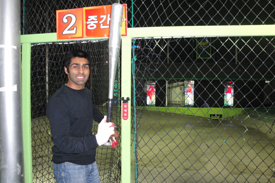 One of the finds of last season's first visit to Mokpo were some baseball nets in town attached to the back of amusement arcades where, for just 1000 won (the equivalent of 55p), punters can try their hand at hitting back 80mph balls fired at them from a machine. The nets were bad news for unimpressed BBC Radio 5 Live commentator David Croft, whose motel room overlooked them directly – and which meant he was in earshot all night of the constant ping of aluminium bat hitting ball. But one man's pain is another's gain and, when Lotus reserve driver Karun Chandhok heard about the nets, he couldn't wait to get himself out there for a go. Straight after his duties finished at the track on Friday, Chandhok went down to the nets with his stacks of won, and within a few attempts he became the first of the F1 fraternity to hit the perfect 27 balls out of 27 balls. That achievement acted as a spur to onlooking F1 photographers, and it was LAT's Lorenzo 'The Sicilian' Bellanca who took it upon himself to uphold their honour. As Bellanca hit the 26th ball, having broken his record of 24, he thought that was the final one – so he turned around to the crowd with his arms held triumphantly aloft. To shouts of, 'No, there's one more to go! ', he turned back just in time to see the last ball whizz past him for a miss. Amid much laughter from onlookers, Chandhok had a huge smile on his face as he reckoned it was the baseball equivalent of Bjorn Wirdheim losing the Monaco F3000 race back in 2003, when he celebrated too early by stopping by his pit crew and lost the victory. How good is Nico Rosberg? Having won the prestigious Sir Williams Lyons Award for young journalists in 1991, Jonathan Noble started his career working for news agency Collings Sport. Working across a number of sports, including motor racing, football and rugby, he was a contributor to a wide range of leading national and international publications including Reuters, the Press Association, the Daily Telegraph and The Independent. He accepted a job at AUTOSPORT Special Projects at the start of 1999, and a year later became F1 Editor of AUTOSPORT magazine – moving across to the website at the end of 2004.